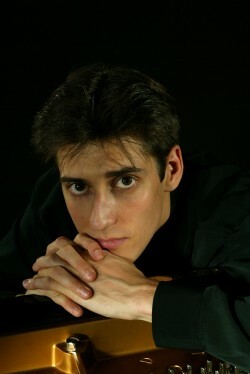 Yevgeny Sudbin has been hailed by The Telegraph as “potentially one of the greatest pianists of the 21st century”. As BIS Records’ only exclusive artist, all of Yevgeny’s recordings have met with critical acclaim and are regularly featured as CD of the Month by BBC Music Magazine or Editor’s Choice by Gramophone. His Scriabin recording was awarded CD of the Year by The Telegraph and received the MIDEM Classical Award for Best Solo Instrument Recording at Cannes. It was described by Gramophone as “a disc in a million” while the International Record Review stated that Yevgeny’s Rachmaninov recording “confirms him as one of the most important pianistic talents of our time”. His 10th anniversary disc of Scarlatti Sonatas was received with equal rapture and not only hit No. 1 in the Classical Music Charts but was also nominated for the Gramophone Classical Music Award. Yevgeny was also nominated as Gramophone Artist of the Year in 2016. Highly praised as a concert soloist — with The Telegraph describing his performance of Rachmaninov's Concerto No. 1 at the BBC Proms as ‘sublime’ — Yevgeny has worked in recent seasons with the Philharmonia, Rotterdams Philharmonisch Orkest, Montreal Symphony Orchestra, as well as Minnesota Orchestra, City of Birmingham Symphony Orchestra, BBC Philharmonic, Luzerner Sinfonieorchester, Czech Philharmonic, Royal Liverpool Philharmonic, New Zealand Symphony Orchestra, Australian Chamber Orchestra and many others. He also performs regularly in many of the world's finest venues and concert series including the Queen Elizabeth Hall (International Piano Series); Tonhalle Zurich; Royal Festival Hall; Concertgebouw (Meesterpianisten, Amsterdam); Avery Fisher Hall (New York) and Davies Symphony Hall (San Francisco). Yevgeny has collaborated with some of the world’s most influential conductors, such as Neeme Järvi, Vladimir Ashkenazy, Osmo Vänskä, Hannu Lintu, Tugan Sokhiev, Mark Wigglesworth, Andrew Litton, Dmitri Slobodeniouk and Vassily Sinaisky. In addition, his love of chamber music has led him to collaborate with many musicians including Alexander Chaushian, Ilya Gringolts, Hilary Hahn, Julia Fischer, the Chilingirian Quartet, Johannes Moser, Vadim Gluzman and many others. Appearances at festivals in the past have included Aspen, Mostly Mozart, Tivoli, Nohant, La Roque d'Antheron, Menton and Verbier. Highlights of his 18/19 season include recitals at Birmingham Town Hall, Kolarac Hall (Belgrade), Chopin Society (London), Vancouver Recital Society and Serate Musicali (Milan). Furthermore, he will make several debuts with orchestras across the globe, including the Cincinnati Symphony Orchestra, NCPA Beijing and Japan Philharmonic, plus make a return visit with the London Chamber Orchestra. Yevgeny was born in St Petersburg in 1980 and began his musical studies at the Specialist Music School of the St Petersburg Conservatory with Lyubov Pevsner at the age of 5. He emigrated with his family to Germany in 1990 where he continued his studies at Hanns Eisler Musikhochschule (Galina Ivanzova). In 1997 Yevgeny moved to London to study at the Purcell School and subsequently the Royal Academy of Music where he completed his Bachelor and Masters degrees under Christopher Elton. He was supported by the Hattori and Pulvermacher Foundations as well as The Wall Trust, of which he is now Vice President. In 2010, he was awarded a Fellowship by Academy and is now a Visiting Professor. Yevgeny lives in London with his wife and three young children and, in his spare time, he is an avid photographer.